It seemed that this whole chaotic cosmos in which the men found themselves had been shaped from atoms and electrons that had formed no fixed pattern of behaviour, and whose one controlling law was chance. Nothing, apparently, was duplicated; the very stones and minerals were anomalous. 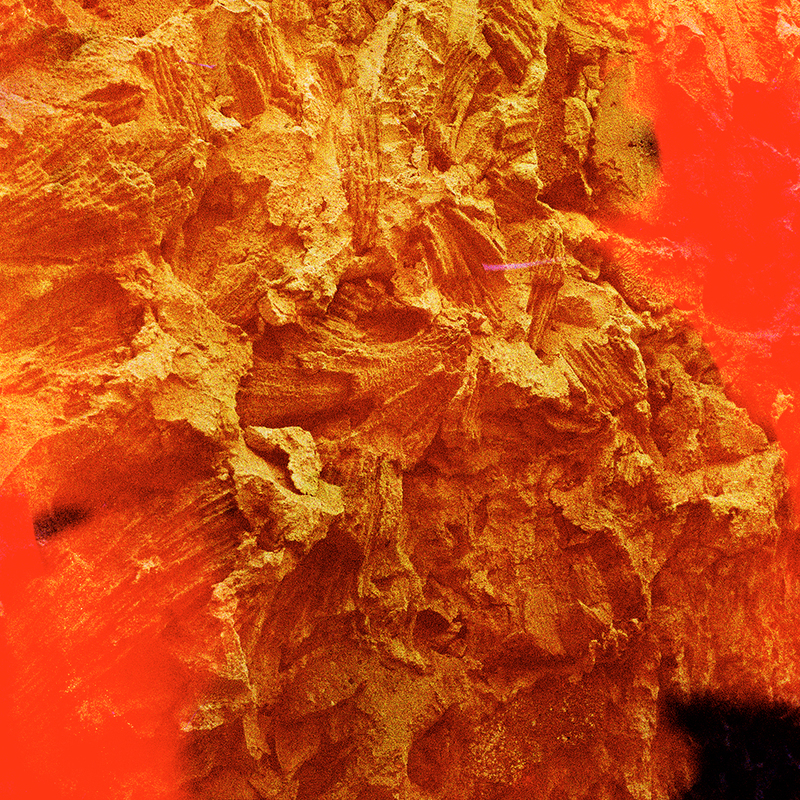 In Basim Magdy’s photograph, we see the texture of coral bricks rendered in orange – a close-up of a wall from an original settlement in Sharjah in the United Arab Emirates, where the material that washed out on the seashore would have traditionally been used for building houses. The colour effect is achieved through an experimental process of exposing the film to industrial chemicals in an enclosed environment over a period of time, which the artist refers to as ‘pickling’. No matter how closely monitored, the process incorporates an element of contingency, a chance occurrence in the working of chemicals that reveals itself during the processing of the film. The title suggests there is an entire world contained in this orange coral wall, which envelops other, distinct worlds. So is Magdy insinuating that the hybrid result of the experiment envisions a future course of the present-day locale in which the photograph is taken by focusing on the material reminiscence of its distant past? The multiple repetitions in the title seem to invite a plurality of interpretations and associative projections from the viewer, and leave the engagement with the image open, flowing, unrestrained by a particular time and space. The prospect of the simultaneous existence of many worlds is an interpretation of quantum mechanics that has been feeding the scientific imagination for some time. As a proposition of parallel realities, it can be traced back to ancient myths and legends, and is an essential ingredient in the work of a large number of science fiction writers. Almost anything is possible in this scenario, including the overlap between alternative histories, time travel or a resolution of the human condition in a utopian society. Basim Magdy was born in 1977 in Assiut, Egypt, and lives and works in Basel and Cairo. His work appeared recently in exhibitions at Deutsche Bank Kunsthalle, Berlin; MoMA – The Museum of Modern Art, New York; KW Institute for Contemporary Art, Berlin; The Museum of Contemporary Photography, Chicago; The New Museum Triennial, New museum, New York; Museum of Modern Art, Warsaw, Warsaw (2015); La Biennale de Montreal, Montreal; Art in General, New York; Monash University Museum of Art | MUMA, Melbourne, Australia; MEDIACITY Seoul Biennial, Seoul Museum of Art, Seoul (2014); 13th Istanbul Biennial, Istanbul; Sharjah Biennial 11, Sharjah, UAE; Yerba Buena Center for the Arts, San Francisco (2013); La Triennale: Intense Proximity, Palais de Tokyo, Paris (2012). Jelena Stojković is an independent art historian, writer and curator based in London. She teaches Fine Art and Photography at the University of the Arts London (Camberwell and LCC). Her book, Surrealism and Photography in 1930s Japan: The Impossible Avant-Garde, is forthcoming from I. B. Tauris in 2017. This feature was first published in The British Journal of Photography, in the April 2015 print issue, as part of the Photocaptionist’s cross publishing projects.